I wish this post could be one of a gourmet meal I make and then I can put the leftovers in one of my Wean Green containers and have some picturesque ‘foodie’ blog post…but it is not; I’m sorry. I am not a cook and unfortunately no matter how many cookbooks I have purchased, recipes I find on Facebook, or Pinterest pictures I see…I have come to realize that cooking is not my forte. I like easy, simple, and quick and Wean Green works best for me and my family. I do have to say I have a nice collection of cookware and storage containers. I still have the infamous ‘junk drawer’ of dollar store plastic containers that have slightly warped sides or I can’t find the matching lid. I really need to do a spring cleaning stat of this drawer and just bring all these ‘food container tire kickers’ to the recycling center!! The storage containers that I will be keeping and actually have nicely displayed in my cupboards are my Wean Green containers. Wean Green are tempered glass food containers that are BPA, PVC, and Phthalate free. There are a few times over the past three years that I have been using Wean Green containers that I have dropped them on the kitchen floor and not one of them has broke. The size that I use the most are the Meal Bowls. This is a perfect single-serve size for a leftover meal for lunch the next day. I also use them a lot to store leftover spaghetti sauce. The newest style of Wean Green container I have just tried is the Meal Tub (this size is the largest Wean Green size). It holds approximately 36oz. and is perfect for making meals ahead of time. 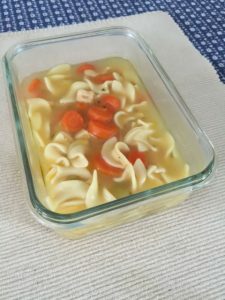 I personally use it to heat up a can of Progresso Soup (the Meal Bowls work well for that too) and it has worked well to hold 2 boxes (cooked) of Annie’s Shells & White Cheddar . This is a constant staple food in our house and I usually buy it by the case. It is also ideal for freezing/storing meals. I am especially looking forward to using the Snack Cubes once my baby (born this coming summer) starts eating solids. I really, really am going to try to make homemade baby food. I remember purchasing organic baby food 8 years ago for my son and I am sure I spent hundreds upon hundreds of dollars. The best features is that all the containers are dishwasher and microwave safe and to boot they are airtight and watertight. I have even turned a Meal Bowl upside down with spaghetti sauce inside and everything stayed put! To get started Wean Green has put together a Wean Green Kitchen Starter Set which gives you a wide variety of their containers. I would start out with this and then you will figure out what your favorite sizes are and then you can purchase specific sizes in a 4 pack. 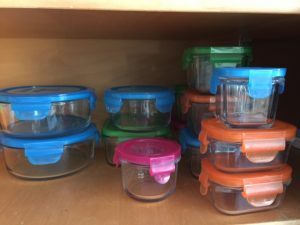 This entry was posted in Blog and tagged eco-friendly containers, food storage, product review, wean green. Bookmark the permalink. The best product I have for my son is the silicone molds I use to make his baby food to freeze in.